Well, it was the last full week of the semester. Cold and busy, I'm still prepping for the winter and finishing up lessons. Because it's right before vacation, we had to do some time waster activities like playing speed English and making Christmas cards. Speed English is a game made popular by the show Star Golden Bell, where they give the guests, usually Korean celebrities, a word to describe to someone who isn't that amazing at Korean. Basically, I was the guesser. It was hilarious. The kids got really into it and it was a great break from the textbook. I got some cute Christmas cards from 4th grade, and today, we watched How the Grinch Stole Christmas, which my 6th graders insisted they were too old for and then proceeded to sit through with their eyes glued to the TV. 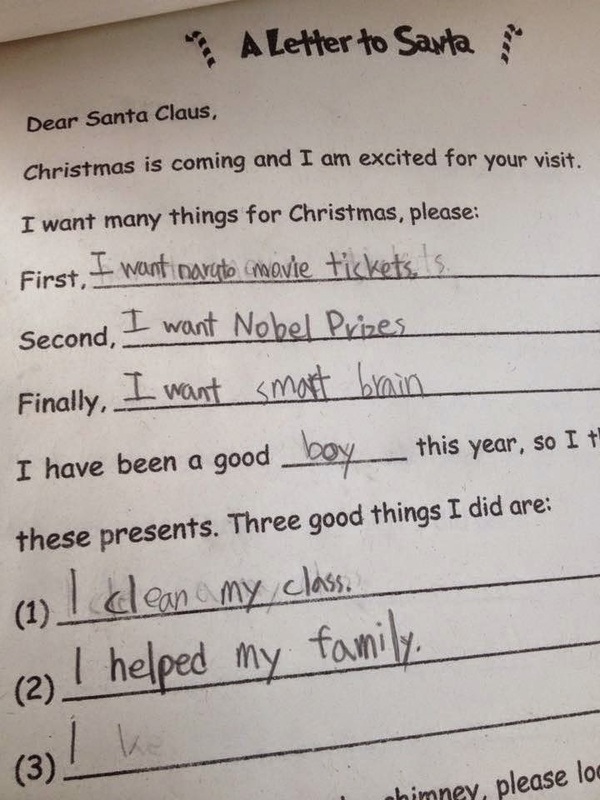 Kids. cold here walking to school without them. They're awesome and I love them. 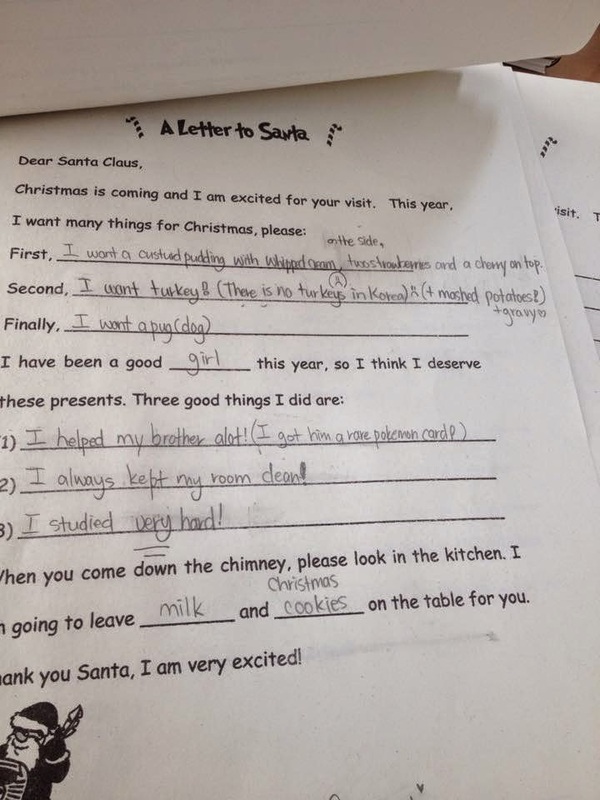 I taught my 5th graders about Christmas and had them write letters to Santa. The creativity was hard for some of them, but I got some really awesome answers. I'm still going through them (I have like 130 to read), but these are a few of my favorites so far. a hard time." I hope. 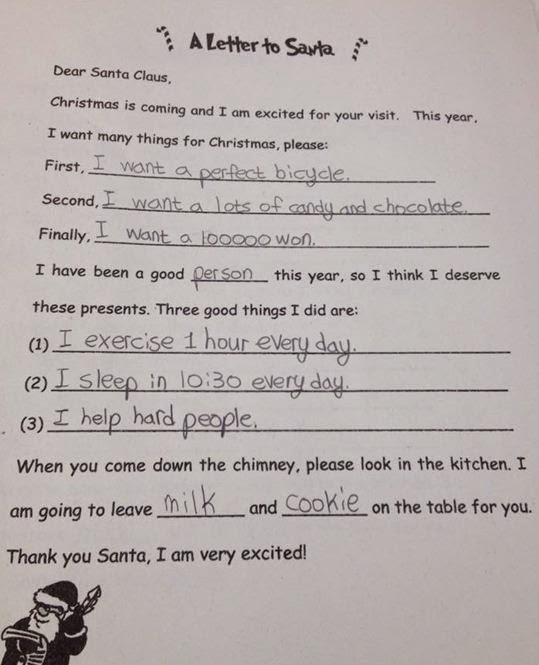 This is my student who was born in America. We often discuss how much we miss turkey. 4th grade made Christmas cards. After having a decidedly stressful week (camp schedule changes- don't ask, vacation planning, end of the semester stuff), Sarah, Cesca and I decided that a visit to the cat cafe was long overdue. The lady even remembered us, even though we haven't been in a month or two! go to these places. Here you go dad. I thought this cat liked me. NOPE. We checked out some of the winter festival lights on the street before we got too cold and called it a night. Mom sends us the best stuff in her care packages!! We had a chill day Saturday. We met Sarah for lunch and tried to hammer out some details for going to Japan in Feburary. So excited! We got 닭갈비 (Dak galbi) for lunch, which is like, spicy chicken mixed with veggies, rice and cheese. We even added cheese filled ddeokbokki. This place allows us to skip to our favorite part, the fried rice part. Some places cook the chicken and veggies first, and then once you eat a bunch of that, they make the fried rice. Buuuut this place puts them together, which makes it awesome. It's also super cheap. Each portion was like 6,000 won, and with the extras, the meal was still only like 8,000 each. Cesca and I experimented with taking the bus to her apartment, rather than the subway. It wasn't faster, but it was nice not having to go bus --> subway --> subway transfer ---> walking. and pay at the end. On Sunday, we ventured to Costco with Lauren, Janell and Ga Hyeon to gather things for Christmas. This was a terrible idea and I do not recommend it. After a harrowing adventure shopping at Costco, we met up with Sarah in Hongdae to hang out for a bit. Their drink sizes were really big and awesome. Then the 3 of us met up with Janell to go see the Nutcracker! Janell had never seen it before, and so we really wanted her to come. Sarah and I saw this production last year, and it was a.) beautiful and b.) cheap, since they offer a foreigner discount. 아싸!! Cesca and I used to go with my mom every year when we were younger, but kind of tapered off after like, middle school. Since Cesca and I are finally together for a Christmas season, we decided to try and revive the tradition. trying to be cute- did we succeed? his GD nose. Ugh. weird. We could only get tickets together Sunday night, so I got home late and subsequently did not have the time or energy to blog until Monday at school. Can't believe Christmas is almost here! I can't wait for my family and friends to see what I got them for Christmas, and I can't wait for a few skype dates and some time with food, friends, and this year, family, in Seoul!!! Woooo!!! Half of a week of school (an easy week, too!!! YAY! ), and I'm free! (Until camp but whatever). Yess!! Merry Christmas, or at least Happy Holidays to all my friends and family, near and far!!! There hasn't been too much kpop wise this week. I've been listening to more Jekyll & Hyde recently, to prep for seeing the show in a couple of weeks, and also because it's awesome. There is one Korean song I've been listening too, because I've been into ballads lately. Sung Si Kyung is super popular in Korea (he's also AMAZING at English- he studied for a while at Magdalen College in Oxford, but basically, he was just really interested in English and wanted to communicate with his German brother in law, so he studied hard and mostly taught himself. Which is pretty cool. The title of the song is kind of mistranslated or just not exactly what I would think. It's a song about running into someone you used to love and the chorus basically says "it's ok, it's ok, it's something from the past..."
The title is "난 좋아 (Even Now)" but Nan jo-ah, to me, means something like, "I'm good" or "I'm fine" or can sometimes mean "I like," which is more accurate than 'Even Now.' The last line of the songs does mention "even now" like, 'Even now I still like you, if you want to come back' kind of a way. But the Korean title and English translation don't exactly match up. I wonder why. It's kind of fun that I can start catching the differences in the way something is used vs translations. Yay!